To celebrate Aulexic’s 2nd Birthday I thought I’d take a few minutes today to answer a reader question and talk more about what exactly it is we do at Aulexic to make our books more reader-friendly, dyslexia-friendly, and even autism-friendly. In this ‘Reader Questions’ post, we respond to a reader who wants to know more about what makes books dyslexia-friendly. How does Aulexic make our books accessible for children with language and literacy difficulties? And in particular what did we do to make the P.I. Penguin books dyslexia-friendly? It was fun breaking down what’s involved in the process. I would love to continue to develop a kind of “Best Practices” Standard. This could be a powerful tool for creating books that are accessible for people with language or literacy difficulties. If you have ideas for other things we can do, share in the comments or send us an email! Now, onto the reader question. This is actually a difficult question to answer concisely. I’ve been meaning to make a detailed list. It’s good to outline all the intricate little details. We incorporate many features to enhance readability. Our primary goal is to publish books that inspire and motivate reading. The key to this is an enjoyable reading experience. And this is particularly challenging for children with dyslexia. Let me see if I can break it down in some sort of sensical way. We start with character and setting that children can relate to. Penguins are cute and lots of children love them. We also use other native species. Again this gives children something to connect with and feel is real and tangible. The characters in the P.I. Penguin adventures are real-world creatures. This helps autistic children relate to them. But we also incorporate anthropomorphic traits. This helps children to feel like they could be those animals or those animals could be them. It stretches the imagination to think of animals in human ways. Imagination can be a challenge for autistic children. Our stories stretch it in a way that should not threaten or disengage an autistic child. We use real world settings so that readers can feel a strong sense of place. Again this helps keep autistic children engaged and interested. Children love to feel like they could be in the world of the story. As if it’s real and they could touch it and transform it themselves. They want to feel like they can be part of the story. This is particularly true for local children or tourists who may have been to the places in our stories. That’s why we use places that are common tourist attractions. Dyslexic children can also enjoy the tangible hands-on sense of place. If children revisit these places after reading the story, they can relive the story by being there in person. They can put the words of the story into actions in the real world. And it doesn’t have to be the actual place; for example, book two incorporates Perth Zoo, but any zoo will invoke that recognition. This allows the child to feel as if they’re in the story world. We focus on things that involve justice and morality, right and wrong. Our target age group can be very matter of fact about those things. They’re learning to understand that truth is shades of grey. We challenge them with concepts they can explore. We encourage them to think critically. Again, this stretches the mindset of autistic children in particular who can tend to think in black and white; very logically. Teachers or parents can also unpack that thinking with the child. But younger readers can take the concepts at face value and believe and accept them. Our P.I. Penguin series also incorporates aspects of socialisation. This includes rules of our society. They feature beliefs of kindness and acceptable behaviour. Children of our target age are learning and exploring those aspects. They’re developing the mindsets and beliefs that will shape their future choices. We also incorporate environmental aspects and our human husbandry of the earth. Again because it’s a core subject in the curriculum for that age group, but also because it gives children an opportunity to develop their sense of self in the larger world. It helps them explore their belonging within it. We chose the mystery genre because it’s a popular one for our target age group (6-12yo). These children are curious and instinctive problem solvers. They want to find out who and why and what so mysteries are effective. Dyslexics also tend to be innately curious and excel at problem solving so it gives us an opportunity to lean into a dyslexic mind strength. The mystery genre also encourages a scientifically investigative mindset. That’s engaging for children with autism who tend to be logical thinkers. They like to break down facts. It also invites hands on experimentation and study. This connects with dyslexics who are very often hands on, tangible learners. These are also skills that are part of the curriculum for our target age group. We’re firm believers in incorporating more than reading skills into story telling. After all, every book is an opportunity to learn. A detective aka private investigator is someone children can admire and look up to. It is a character they can aspire to be like because it’s professional and established. At the same time the penguin has a very childlike innocence. He has a sense of the right and wrong. He also has an ache and longing for family. These are all familiar to children of that age. We decided to make P.I. Penguin an adult which might contradict the ability to relate to the character, but we needed him to have the autonomy to move freely around our world. He needed to make mature decisions, take independent action, and face real challenges. That demands a character with more worldly experience than a child. Thankfully, he doesn’t feel grown up. He still shows he needs support and can’t do it all by himself so children can relate to him. We deliberately opt NOT to simplify the language or limit the vocabulary. Children tend to have quite a diverse and comprehensive vocabulary for comprehension. They understand more than they can read. Stories that use only basic, simplified word structure and language can feel condescending and boring. Books that are too simplistic for their age can demean and damage a child’s self-esteem. This is a significant challenge for children with language and literacy difficulties. Instead, we encourage “read together”. If the language is too complex for independent success work as a team! We promote shared reading experiences between an able reader and an emergent reader. We want children to feel supported. We encourage parents and teachers to scaffold their child’s reading experiences. We also encourage the use of assistive technologies to support development of reading skills. Give children rich stories, and they’ll want to work out how to read them! Further, we use rich language and poetic tools and structure to create a cadence and rhythm to the story. There is rhyme and meter, alliteration, and a careful structuring in the language. This optimises the lyrical flow of the story. When read aloud it should feel as if it could be a nursery rhyme. And yet, it’s written as prose because it is a “story”. We use formulaic story structure. We incorporate a foundation of cause and effect. The narrative has a beginning, middle, and end which is the true core of story and plot arcs. All this combines to make a true narrative rather than a just combination of words put in order. Our language practices create a sense of expectation and predictability in the text. Children can have an instinctive knowing about the words that should come. Language itself is actually very sensible when it’s broken down to fundamental states. Only complex writing becomes convoluted and difficult to understand and comprehend. A well written story should flow. The surprise shouldn’t be in the language, but in the twists and turns of the story. People who study creative writing at university would say the opposite. They tend to believe that true “art” aka literary writing is in the twists and turns of the language. But, you’ll find most bestsellers are simple to read. The art and richness of their stories are in the plot and character not the words themselves. Although we don’t dumb down the words we choose, we do simplify sentence structure. We also shorten line length and limit the number of words per page. This means a child has fewer opportunities to struggle and fail per page. They have a higher likelihood of having entire pages be error-free. We do this because I noticed something in my son’s experience. Every time my son made a mistake with a word he was reading, he found every word after that harder to decode. His confidence was shaken. To build his confidence, it was important to ensure that he was having lots of little wins. Reading a line or a sentence or a page without errors feels like lots of massive wins to a developing reader. In P.I. Penguin we use bright, colourful illustrations with a young tone. We found bright, colourful illustrations with solid lines and limited intricacy gives the eyes a chance to rest. Readers get more downtime between the language, the picture, and the page turn. The strong colours are also good for softening contrast which I’ll talk about more later. We also use illustration that agrees with the words on the page rather than contradicts them. We want children to feel like they could tell a true version of the story from the pictures. In some picture books the opposite is true. The pictures contradict the words to add an extra layer of depth to the story. As a dyslexic reader, I found this problematic. It took me a long time to grasp the extra depth and made learning to read much harder. When the picture disagreed with the text I assumed I had read the words wrong. So, I would go back to read it again and of course again the words wouldn’t make sense of the picture. So it was important that we incorporated illustration that agreed with the text. It reinforces the readers confidence in their comprehension. They know they’re reading the words and interpreting the correct story. We add more dyslexia-friendly aspects in the formatting. We use the Dyslexie font designed by a dyslexic dutch graphic designer. Every letter formation in the Dyslexie font is unique and distinct from any other. The weighted fonts are heavy to the bottom of the letter. These traits make it easier for dyslexics to distinguish the individual letters. We tend to experience less sense of movement. There’s a lot of debate about the value of font choice with dyslexia. (I’ve written an entire blog post about it.). To summarise, we compared and contrasted different font choices. We found most of our small test group preferred Dyslexie. We felt clear advantages over other fonts (including other supposedly dyslexia-friendly fonts). Because we base our decision on the anecdotal preferences of a limited study group it isn’t considered “evidence-based”. We base most of Aulexic’s specialist knowledge on the real world observation and experience of people with language and literacy difficulties. We want to know what works. What helps people. And the best way to know is to ask them! Unfortunately, we’ve found sometimes so called “evidence-based” research contradicts real world experience. It often does not incorporate the voice (and minds) of the people studied or interprets data in contradictory ways. In formatting we also use soft contrast backgrounds. We lay text across parts of the image with shades of colour (often pastel tones as the illustrations allow). We’ve found this benefits the dyslexics we’ve worked with vs high contrast black and white, vibrant hues, or contradictory contrast. We also invest more in printing because of some of the readability aspects I refuse to compromise on. For example, for the P.I. Penguin series needed to have full colour illustrations. To prevent glare and reflection it also had to be matte paper rather than glossy. When I produced the first P.I. Penguin book, I used print-on-demand (POD) technology with CreateSpace and Ingram Spark. In both cases the GSM (thickness) of the paper choices available through POD meant the colours and text would bleed through the pages. You would see the illustration and text of the reverse page on the page you were trying to read. Problematic to say the least. We’ve had to opt for the more expensive option of offset printing in bulk. This allows us to opt for thicker, high-quality paper. We also opted for the particular shape and size of the P.I. Penguin series after a great deal of deliberation and collaboration with librarians. Our first P.I. Penguin book was a square book like so many picture books I had seen. It was a size common to POD picture books. But, after discussion and a firm decision to make these books targeted to older, school-aged readers, we decided to lean into a more traditional “novel” style trim size. We wanted older readers to feel less stigma about reading a picture book. Again, this meant more expense in printing but a better product. It helped ensure we were best suited to reach our target market. Okay… I think I’ve remembered everything. Maybe. Odds are there are other either deliberate or subconscious decisions for readability. We hope we’ve done a great job with this particular series. We want to create books that are ideal for their purpose and their target readership. So, what did I miss? OH! The inclusion of a glossary! We put that at the beginning, rather than the end, so that children have a chance to get familiar with unfamiliar words before they face them in the story. This enhances their vocabulary and causes less uncertainty as the story unfolds. So, what makes books dyslexia-friendly? As you can see, there are LOTS of intricate aspects involved. The story and series is an evolution of both conscious or unconscious decisions. We want to make sure our books suit their purpose. Are they right for the story? Are they right for the target market? Are they right for children with dyslexia, autism, or other language, literacy, or learning difficulties? 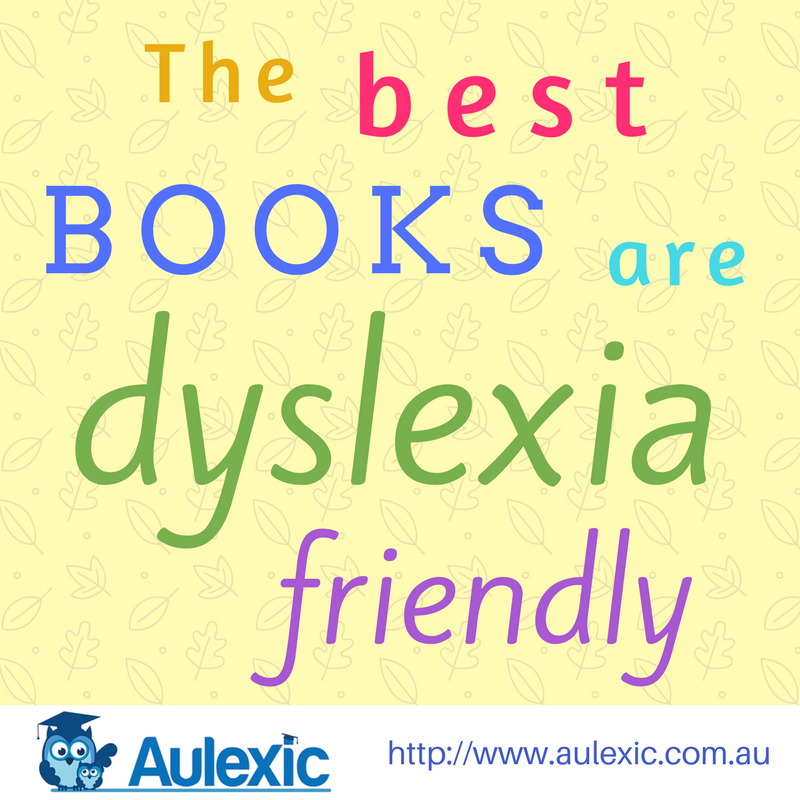 Are they right for the core purpose of Aulexic, which is to foster a child’s love of reading. What else do you think might make a book more dyslexia-friendly?